Dr. Sanjay Madnani talks about issues related to Fibromyalgia at the Coping with Chronic Pain and Fibromyalgia Seminar. 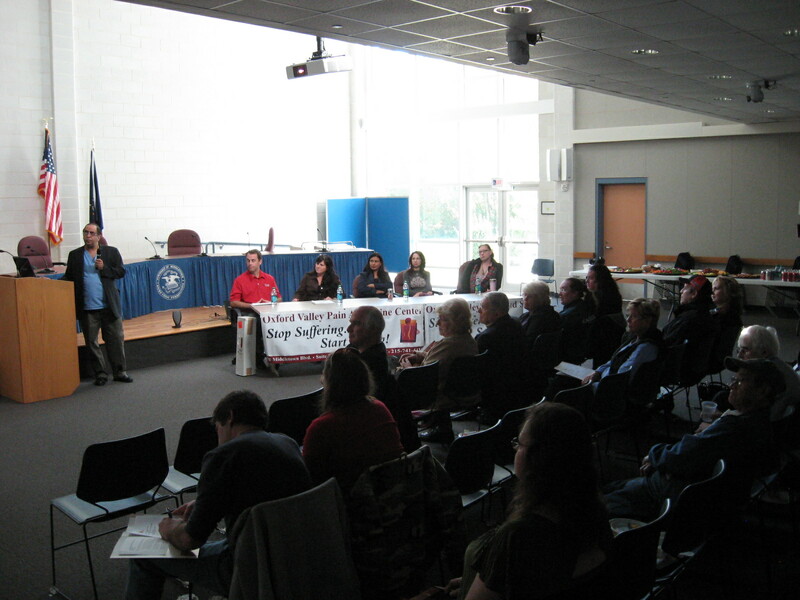 On Saturday, Nov. 5, Oxford Valley Pain and Spine Center presented a well-received Coping with Chronic Pain and Fibromyalgia Seminar at the Middletown Township Municipal Center. Thank you to all the attendees and presenters, as well as Paul Kopera and his team at the Middletown Township Parks and Recreation Department for making the event a success. 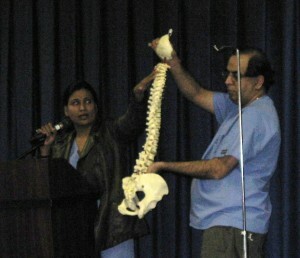 Speakers Dr. Anju Madnani, Dr. Sanjay Madnani, PRO/ATI physical therapist Tim Flaherty, attorney Paula Robinson, massage therapist Veronica Salber and yoga instructor Julie Cerrato shared a wealth of valuable information including causes and treatments for chronic pain, how to protect yourself legally when dealing with work-related injuries and the benefits of hydrotherapy, yoga and massage. Drs. Madnani also announced that they are both enrolled at Harvard University for a course in acupuncture for physicians, which they expect to complete in the spring. The Anesthesiology Pain Fellowship-trained and board-certified physicians look forward to offering acupuncture as another treatment for their patients. The seminar feedback we received, via a survey attendees completed, will help us plan future seminars. It showed that the “most helpful topics” included explaining about the spine, chronic pain, Fibromyalgia, disc problems, epidural injections, hydrotherapy, yoga and massage. Topics requested for future seminars include acupuncture, grants or other means to pay for services, spinal stimulation, and Multiple Sclerosis pain. Many attendees also showed interest in participating in free upcoming Healing Yoga Sessions on Monday, November 28 and December 19. For more information or to register, call 215-741-4410. The Drs. Madnani also received fabulous feedback on Tuesday’s visit to Wood River Village in Bensalem for a Chronic Pain presentation for residents, a few of whom happen to be patients of Oxford Valley Pain and Spine Center. With permission, we’ll post video of their unsolicited testimonials in an upcoming blog post. Some of the comments included a woman who shared that her friends always ask her why she is always walking fast and running. “I will continue to walk fast and run thanks to the doctors,” she said. Another woman shared that when she went to Oxford Valley Pain and Spine Center with her daughter, Dr. Madnani spoke with her daughter but also spoke directly to her and not over her head. “You treated me as though I counted and I thank you,” she said. This entry was posted in Uncategorized and tagged acupuncture, chronic pain, Dr. Anju Madnani, Dr. Sanjay Madnani, healing yoga, Julie Cerrato, massage, Oxford Valley Pain & Spine Center, Paula Robinson, physical therapy, Wood River Village, yoga. Bookmark the permalink. I attended the last seminar which was interesting and informative. I have had some undiagnosed pain in part of my chest for over a year. Tests, mammorgrams and untra sound showed nothing. I listened to the yoga instructor and found the deep breathing exercises very interesting. I do them 4 or 5 times a day and in a matter of a week or so I am pain free. I remember her saying something about blocked lymph nodes and glands if we don’t breathe deep. This may have been my problem that the doctor could not figure out. I will keep doing the breathing exercises. Thank you.